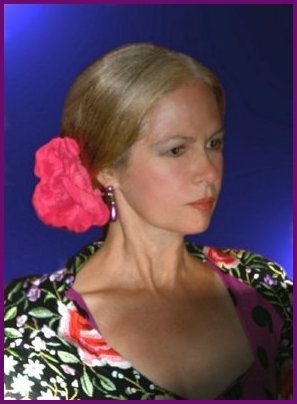 Diana has devoted much of her life to the art of flamenco. She has performed at various venues in Spain, including one of Madrid's most famous tablaos, the legendary Cuevas de Nemesio. She has also performed in New York at numerous theatres and tablaos, including Avery Fisher Hall, Chateau Madrid and Mesón Flamenco with artists such as Domingo Alvarado, Agustin Castellón, Emilio Prados, Pedro Cortes, La Romera, Jorge Navarro, Esmeralda Enrique, Marcela de Real and Ramon de los Reyes. Diana was co-founder and Artistic Director of Arte Flamenco Dance Co, and later, Flamenco Puro. She has been featured in TV and radio programs, music festivals and concerts. She has performed as guest artist with Boston Flamenco Ballet, Teo Morca and Al Andalus, to name a few. Although Diana enjoys seeing the many changes and developments that flamenco has undergone as it continues to evolve, she prefers the spontaneity and intimacy of the folk setting, as opposed to the more formal theatrical style, and strives to preserve these traditions.